The best is a multi-purpose and the most SEO optimized is what we've published so far and you can find it on the internet. In search engines like Google and Bing, we make the responsive. This is a fully responsive and elegant SEO friendly. The BEST is coded in a new way, where it loads fast and carefully encoded scripts so that it can be loaded as early as possible. It is designed for any type of newspaper, blog, magazine, portal and personal type website. The best has some important features. This is a highly researched for Blogspot Platform, so you can do it easily in many search engines, whether it's Google, Bing or any other search engine, it will display every other modern . 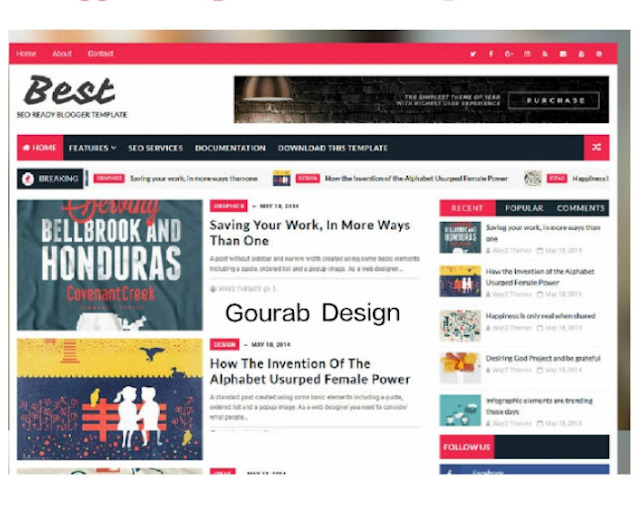 it is suitable for any topic or specific site but it is specially designed for a newspaper, blog, magazine, portal and personal type websites. This theme is coded in a new way where it is packed with a superb responsive with superb SEO-friendly and SEO optimized designs. SEO optimizaton is remembered for each widget and features. It comes in a completely customized description and shows a vague background that is customizable with a simple CSS code and loads with color of action as a combination of black and white professional colors.